WARSAW — The new county sheriff took a bold step Tuesday, Jan. 22, to bolster healthcare efforts for inmates of the Kosciusko County Jail. 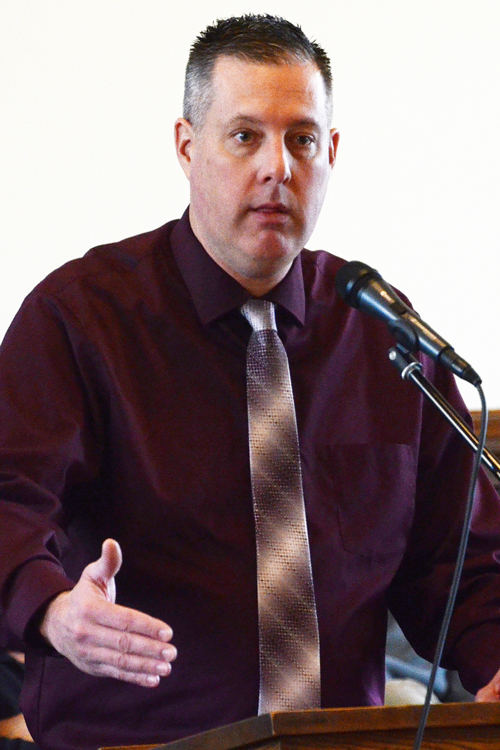 Kyle Dukes, who took over his new role as the county’s top law enforcer on Jan. 1, presented before the regular meeting of the Kosciusko County Board of Commissioners and told the panel that a change was needed in the county’s jail medical contract. County Sheriff Kyle Dukes speaks before the Kosciusko County Board of Commissioners Tuesday morning, Jan. 22. “The Kosciusko County medical contract for our jail expires Feb. 1,” said Dukes, making his first presentation to the commissioners as the county sheriff. “The current medical company that we have is Advanced Correctional Healthcare,” he said. According to Dukes, a representative from the current company presented the company’s available services and the sheriff told commissioners Cary Groninger and Bob Conley (Brad Jackson was absent) that he heard the entire presentation. He added that another company, Quality Correctional Care, also provided a presentation of what it could offer. He told Groninger and Conley that the current company provides two nurses 70 hours each week for the jail inmates. He said he felt it was time for a change. “One thing that Quality provided that Advanced does not is that instead of 70 hours a week, they came in at 80 hours a week,” he said. Dukes added that Quality Correctional Care is based in Indiana and that the owner had previous ties to law enforcement. He said that during their presentation, the Quality Correctional Care representative addressed that company’s assumption of liability. For Dukes, the final element that sealed his decision related to an aspect of inmate health that might not always be at the forefront of consideration. Dukes said that while the county would end up spending more money to switch providers, he felt that the benefits outweighed the costs. Commissioners Groninger and Conley approved the jail’s medical contract change to Quality Correctional Care. Approved a resolution for a commissioners sale. Approved a services agreement with SRI. Approved a contract regarding Bridge 227. Approved a commitment letter for the 2019 Community Crossings Grant. Opened bids for new County Highway Department equipment. Heard a presentation from the Area Plan Commission on the Community Rating System Recertification. The next regular meeting will be held at 9 a.m. Tuesday, Feb. 5.